Nowadays, it is rare that an academic book is seen in an actual bookstore (and, if it is, not for long). Price is a factor here (see below). There are exceptions, of course, one of them for NIAS Press being Chris Hudson’s Beyond Singapore Girl, which continues to resonate (and sell) especially in the Singaporean society it analyses. 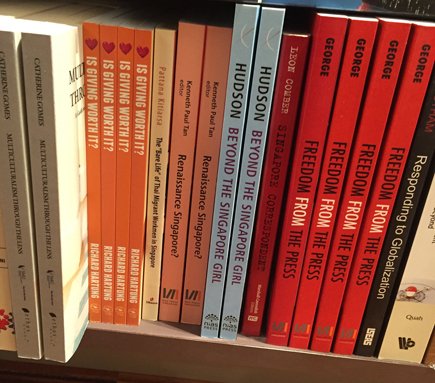 But as discussed elsewhere the brutal reality for most books found in any bookstore is to appear spine-out – as can be seen in this line of books recently photographed in a Kinokuniya bookstore in Singapore. The same goes for books found on library bookshelves. Very few books are displayed cover-out in all their glory. In bookstores, normally full-frontal display is reserved for bestsellers or those other titles being heavily promoted (sometimes publishers pay booksellers for such special treatment, not least a premium location inside the store). Since academic books rarely appear in bookstores, do covers matter then? Arguably, yes. Bookstores and libraries are not the only places where books are visible. Physically they also will appear in conference exhibits, on display at the author’s home institute and certainly in her own office. But in a host of other places, a book’s cover is visible – in marketing material (catalogues, flyers, etc. ), newsletters and (not least) face-out on the virtual bookshelves of all of the online bookstores. 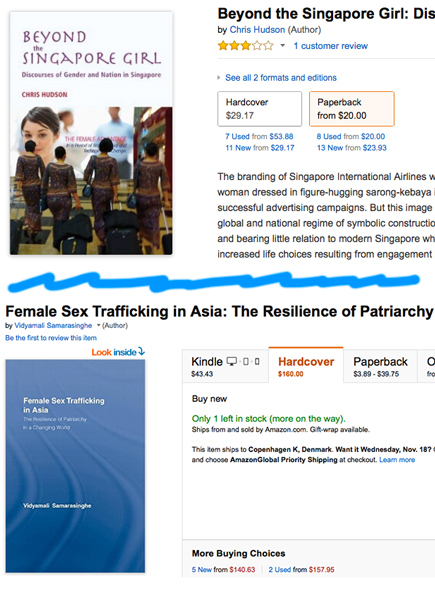 Compare the listings on Amazon.com of the same book by Chris Hudson with a book from a different gender series from another publisher. Personally, I know which book I would rather show my colleagues, friends and family. We’ll say nothing about the price (though obviously this matters, especially if the book buyer is an ordinary person with limited funds). This entry was posted on Monday, November 16th, 2015 at 9:26 am and is filed under Academic publishing today, Promoting your book, Technical issues. You can follow any responses to this entry through the RSS 2.0 feed. You can leave a response, or trackback from your own site.